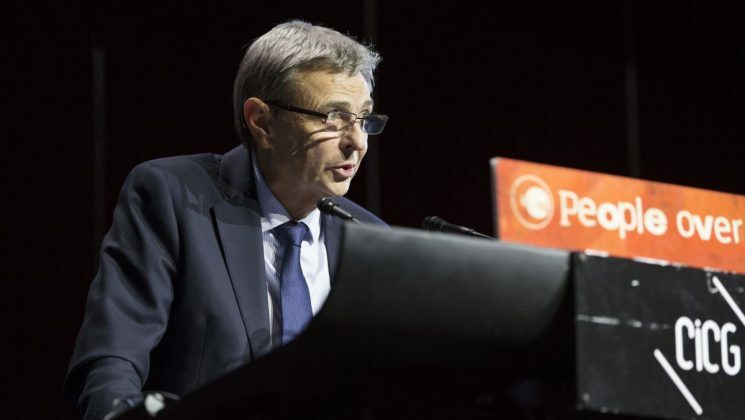 The work of trade unions has never been more important, Dave Prentis stressed when he opened the Public Services International (PSI) congress in Geneva last night. PSI is a federation of public service unions that represents 20 million workers from 150 countries. 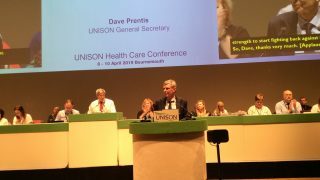 As president, Mr Prentis spoke of the shared challenges public sector workers are facing, from rising inequality, to privatisation, growing racism and xenophobia, and corporate power. He told congress that there was no better time to meet. “Our work has never been more important,” he said. PSI’s organising and campaigning work on “growing our unions and building our power” is essential in the struggle to tackle the greed of multinationals. It was PSI that identified the Ebola crisis three months before everyone else, he pointed out – an illustration of how public sector workers went above and beyond. The outbreak saw health workers fighting against an “horrific disease in incredibly difficult circumstances,” many of them not being paid or not having the right to join a union. PSI champions human rights, is an advocate for social justice and promotes universal access to quality public services. Mr Prentis urged congress to be strong. “If we are bold, if we have hope, we can win. But if we try to play it safe and bow to the wishes and the whims of the rich and the powerful, then the results are dire. To keep up with news from the PSI conference, follow UNISON international on Twitter and the hash tag #PSIcongress2017, or on Facebook. UNISON works with individual unions and global union federations around the world to defend public services, fight against austerity and defend human and trade union rights wherever they are under attack.